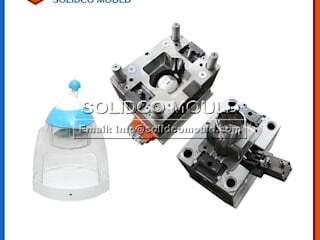 With an advanced design system,SOLIDCO MOULD is responsible for forward-looking research and new product development.By completing UG, SOLIDWORKS, MOULD FLOW,PRO/E,AUTOCAD ,CATIA software,the crate mould Manufacturers optimizes the part and mould design to improve the mould performance.All the moulds making only can be started when the detailed mould drawings are finished and confirmed!Hot runner with 6 valve gates, from the fill process, we can see hesitation on the top center. And there are weld lines on the main surface.No.1 opened first, when the melt front reached the No.2&3 gates, No.2&3 opened, then the No.4&5 opened, in this mode .the top side may filled before the underside. NO.36, Jinchuan Road, North Industrial Zone, Huangyan, Taizhou, Zhejiang, China. Although the runner is unbalanced, but trash can mould Suppliers can control the time of the valve gates to decrease the influence of the unbalanced flow. And the 4 gates on the top side can give a good compensation for shrinkage.Most of the weld lines happened on the grid, there are no weld lines on the main appearance. With a factory area of 3,000 square meters,our workshop has a full set of cnc mould processing equipment,including: >10 sets of CNC milling machines >15 sets of CNC engraving machines >4 sets of Electrical discharge machines >10 sets of wire Cutting machines >2 sets of Drilling machines >1 set of die-spotting machine SOLIDCO MOULD is increasing its strong technical force. The complete hardware equipment can not only reduce costs,but also allow us to supervise mould machining and control the mould manufacturing schedule.